Mastering Oracle Trace Data is a 1-day course based on Cary Millsap’s The Method R Guide to Mastering Oracle Trace Data. How long? How long does your program take to execute? Why? Why does it run for so long? How much time should it take? Is it efficient? Does it waste resources? What if? What would happen to that duration as a consequence of each of the various changes you might consider for the system? What else? Is there anything else you could do to make this program spend less time? Whether you’ve bought your software or built it yourself, trace files help you make better informed decisions about performance. They help Oracle developers, DBAs, and decision makers in every phase of the software life cycle. To attend this course, each student must have a valid Method R Workbench product license key. If you are not already a Workbench licensee, you may purchase a license key from our software exclusive reseller, Cintra Software & Services. We offer a 30-day license or a discounted 1-year license. A profiler that shows exactly how your programs spend your time, using color and structure to guide your analysis. A powerful utility suite that includes a trace file data mining tool, utilities for adjusting trace files, and more. Method R Trace, our zero-click trace file collector for Oracle SQL Developer users. A PDF copy of The Method R Guide to Mastering Oracle Trace Data (bound copies are available separately at Amazon.com). When taught online, the course consists of two 3-hour modules delivered on consecutive days. When taught in person, the course runs for one day from 9 a.m. to 4 p.m.
Our most successful students are the ones who use the tools and techniques from the course to solve real problems immediately after completing the course. Not all students take the time or have the commitment to do this. You can ensure that your students put their classroom experience to work right away by booking optional lab time. The labs, which we can schedule for half a day or more, gives students extra time with the instructor to install the Method R software and accelerate their learning curve with supervised practice. 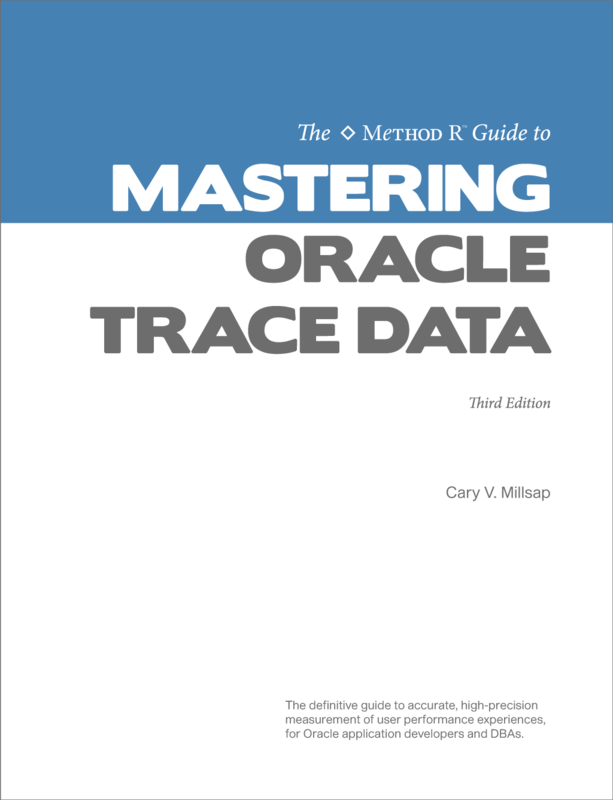 The Method R Guide to Mastering Oracle Trace Data by Cary Millsap is a comprehensively detailed, full-color, 325-page textbook that serves as a valuable reference long after you complete the course. Click here for Cary Millsap’s story of how this course came to be. See https://method-r.com/pricing for current pricing. Pricing for optional follow-up lab time varies by headcount, location, and duration. Taxes and additional service fees may apply. Groups of 10 or more registering simultaneously qualify for a course fee discount. Some user groups offer discounts for their members. Existing Method R software licensees with active software maintenance contracts receive a course fee discount instead of redundant software licenses. Looking for first-class education without the travel costs for your whole team? By hosting the course at your facility and helping us attract students, we can bring the course right to you. Hosting a public course saves money and provides the ultimate in convenience for you and your colleagues. Write us at courses@method-r.com if you’re interested in hosting a public course. A private course taught at your facility ensures that your staff can be completely open with their classroom discussions. The course curriculum fits tightly into the scheduled format, but we can offer additional days of instruction in which your staff can work directly with the instructor on the subject matter in your company’s specific context. Our minimum student count for private courses varies by location and is generally proportional to the time and expense required to reach your facility from our office near the DFW Airport. Write us at courses@method-r.com if you’re interested in hosting a private course.